Have you ever dodged a turd or several while walking around the streets of Bushwick? Have you perhaps found yourself wondering whether or not the neighborhood's plethora of poops will ever be fully cleaned up? If you have, reader, know that the creator of the Instagram account shitsofbushwick seems to have had similar experiences. The feed, which has more than 140 followers, is a raw exhibition of Bushwick’s often littered sidewalks. 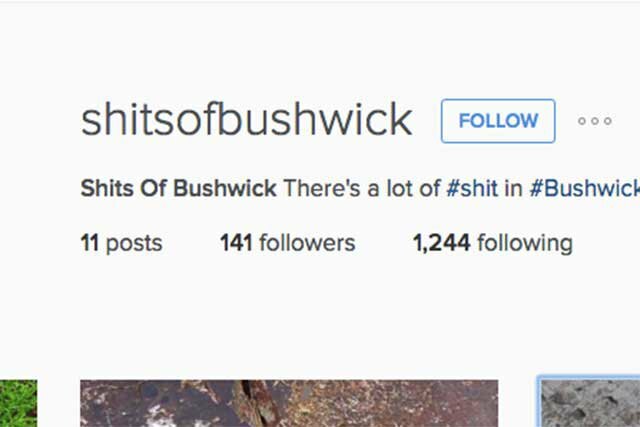 "It's a cheeky commentary on internet culture, Instagram art, Bushwick hype and millennial egotism all packaged under one neat little phonetically-catchy name, which I thought of long before ever snapping that first shitpic. I like the idea of having it be anonymous and open to interpretation, but it's funny that you speculated it might be a community improvement project because that's what I'm most self-conscious of when trying to take a photo - that someone might think I'm obsessively compulsively (or anally-retentively?) documenting a complaint rather than just perpetuating a personal in-joke." You can be fined a lot if you don’t pick up after your dog. The difficulty in enforcing the law, though, is that it’s hard for a dog owner to be caught. Do you personally know anybody who has been fined for this offense? Bushwick's sidewalk poop problems are not new, and are well chronicled: It’s only been two years since the Banksy of poop bedazzling last struck.